The Negev is a desert and semidesert region in the southern part of Israel, an inverted triangle with the Gulf of Aqaba and the resort city of Eilat at the bottom tip. The area north of Eilat is great for hiking and photography and one of my favorite places is this small, slot canyon just off highway 12. The technical details – the photo was taken with a Nikon D90 digital SLR camera in March 2010 (ISO 220, 18mm, F5.6 at 1/250 sec). This entry was posted in Nature, Negev, Photography and tagged desert, Eilat, Negev, photo of the week, slot canyon on May 4, 2016 by Shmuel Browns. Among deserts, the Judean desert is considered relatively small, spanning only 1,500 square kilometers, but it includes many fascinating nature reserves, historic sites and monasteries that make it an interesting and unique place to visit. 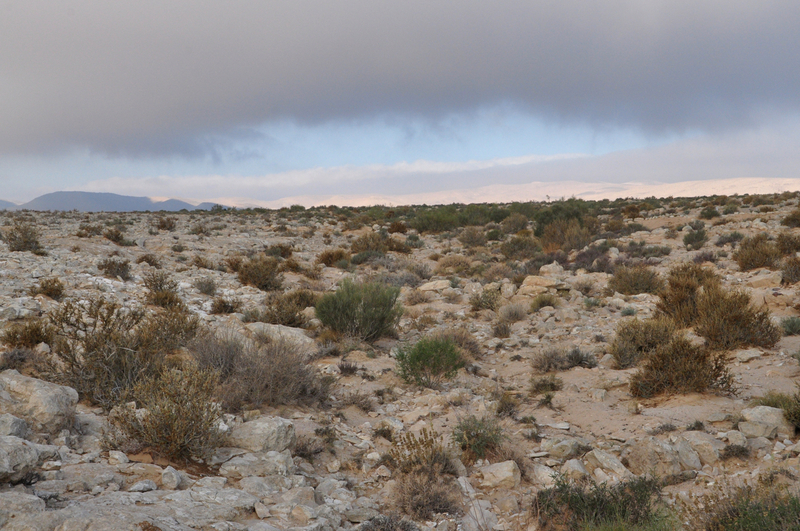 An area bordered by cliffs on both sides it is a desert with running water and in one place geothermal springs. 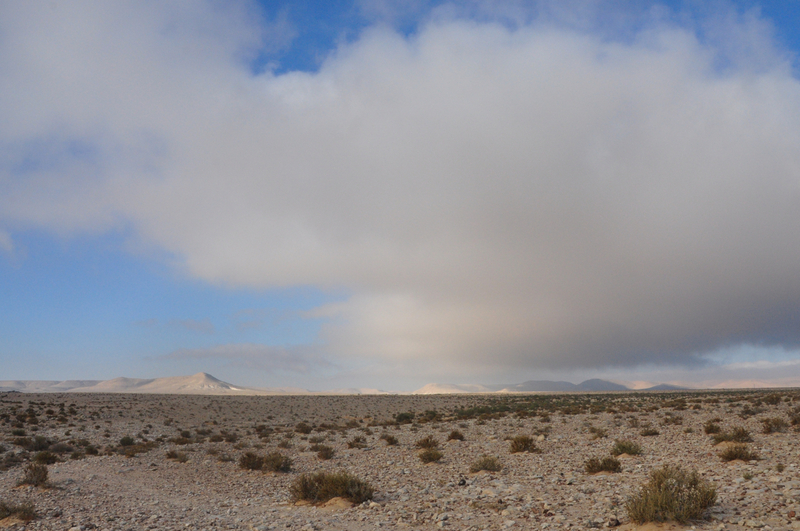 If you are into photography its primeval panoramas make it a special place to photograph. As your guide I’ll take you there to explore. The technical details – this photo was taken in the afternoon with my Nikon D90 digital SLR camera in February 2013 (ISO 200, 52mm, F11 at 1/400 sec). Clicking on the image will display it larger. This entry was posted in Desert, Nature, Photography and tagged desert, landscape, photo of the week, photographs, photography tour on March 23, 2016 by Shmuel Browns. I am intrigued by the desert areas of Israel and find them fascinating places to photograph – I’d be happy to take you to explore and photograph. 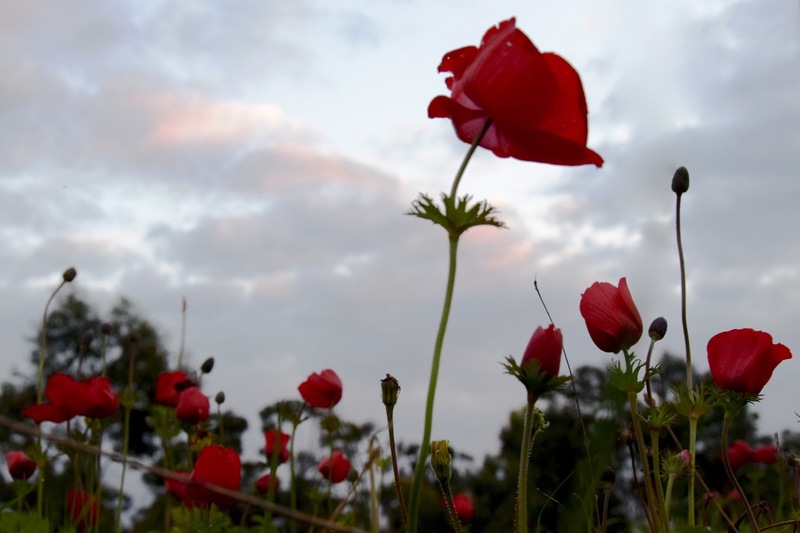 Rainy and cold all day yesterday in Jerusalem so I drove down to the western Negev to see the kalaniot (Anemone coronaria) in bloom one more time. The technical details – the photo was taken with a Nikon 5300 digital SLR camera yesterday just before sunset (ISO 1600, 32mm, F9 at 1/250 sec). Clicking on the image will display it larger. This entry was posted in Desert, Nature, Photography, Wildflowers and tagged anemomes, biodiversity, desert, Negev, photo of the week on February 9, 2016 by Shmuel Browns. I’m thinking about the Negev. The Negev covers some 13,000 km² (4,700 sq mi) and makes up more than 55% of Israel’s land area. 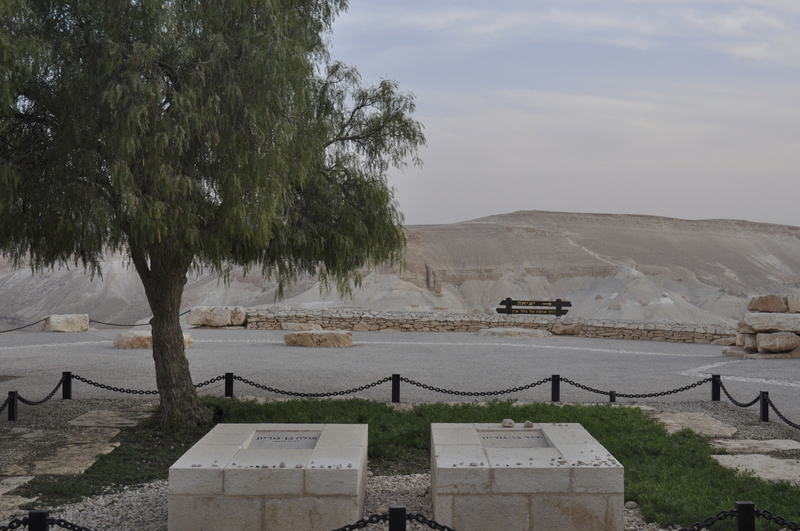 Ben Gurion, Israel’s first prime minister and statesman, saw the Negev as the key to a viable Israel. He joined Kibbutz Sde Boker in the Negev in 1970, lived the last 3 years of his life there and is buried overlooking Nahal Zin. There are some remarkable sites in the area for hiking and photography : Ein Avdat, white cliffs, reflection pool and Griffon vultures (like angels) soaring overhead and a hike across a high plateau to a spring, Ein Akev, in a stream bed. This part of the Negev is a rocky desert, a melange of brown, rocky, dusty mountains interrupted by dry stream beds, in Hebrew nahal, in Arabic wadi. 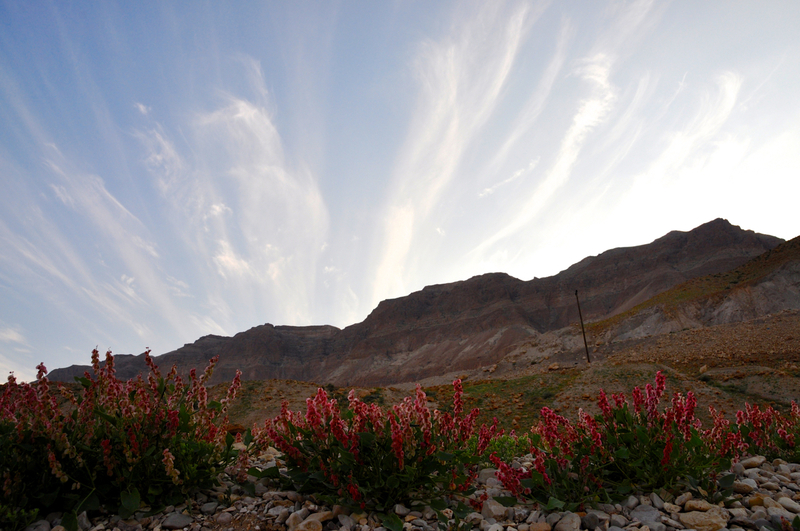 The photographs below are the view across the plateau from an early morning hike with Bonna in August 2013. This week, Rosh Hodesh Tammuz, we celebrate our 34th wedding anniversary. In the first photo, there is a lot of foreground, brush, rocks, sand stretching to the distant horizon. In the second, there is little foreground and a lot of sky. The shift in the horizon line creates a dramatically different effect. 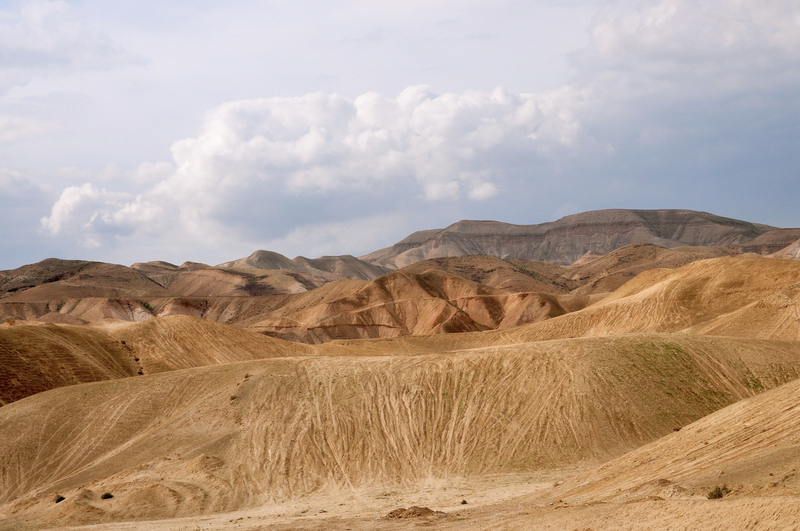 I hope they capture some of the barrenness, expanse and spiritual power of the Negev. This entry was posted in Desert, Hiking, Nature, Photography and tagged desert, desert hike, desert photographs on June 16, 2015 by Shmuel Browns. The Dead Sea and Judean desert are just a half hour drive down the hill from Jerusalem making it very accessible. It is the lowest place on earth, 409 meters below sea level, an area bordered by mountains on both sides in a desert with running water and in one area geothermal springs. I drove down this week to enjoy the hot springs and float in the mineral-rich cool sea. I can’t remember a time when i’ve seen the hills so green with so many wildflowers blooming. The technical details – the photo was taken with a Nikon D90 digital SLR camera in March (ISO 200, 20mm, F10 at 1/250 sec). Clicking on the image will display it larger. This entry was posted in Desert, Nature, Photography and tagged biodiversity, desert, photo of the week on March 18, 2015 by Shmuel Browns. In Israel’s Negev desert are three examples of a geological formation unique to this area, the makhtesh. You can go off-road and explore it by jeep or hike in the makhtesh but a paved road gives easy access to travelers. Highway <228> from Yeruham crosses the Large Makhtesh and highway <40> a scenic route drops 250 meters and traverses Makhtesh Ramon on the way to Eilat. There are two smaller access roads that take you to the Small Makhtesh. Each makhtesh is a great place for photographs. The technical details: the photo was shot at 6pm in January in the Large Makhtesh with a Lumix point and shoot camera, ISO 125, 4.1mm, F3.3 at 1/40 sec. 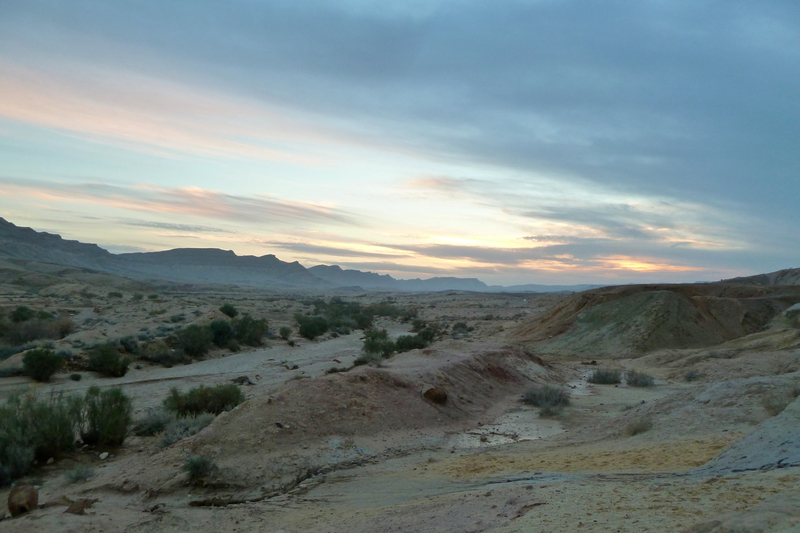 This entry was posted in Nature, Photography and tagged colored sand, desert, desert landscape, makhtesh, Negev, sandstone, sunset on November 3, 2014 by Shmuel Browns.